For most of us hiking enthusiasts, it’s an activity we enjoy all year round – not just when the weather is dry and sunny. This includes winter too, because hikes during this time of the year can be truly magical and relaxing. Of course, to go out during the winter, you also need the right equipment. When talking about this, most people think about a 4-season tent or a hardshell jacket. But a good set of crampons (or microspikes) is also very important. This gear is used to make your step more stable. They come in different shapes and designs, because they need to perform in difficult circumstances. Some are used on flat surfaces for walking, while others are used by alpinists for technical climbing. To find the best crampons out there, you need to think about where and how you’ll be using them. Our product choice was made with an accent on hiking. We also created a buying guide where we discussed the available options, and all the ups and downs that come with them. We start with a well known product which is very popular among hikers and climbers. Kahtoola Microspikes offer you great stability thanks to excellent spike positioning. These spikes are made from heat-treated stainless steel, while the harness is made of strong elastomer. The components are connected with welded steel chain for added durability. Eyelets on the harness are reinforced so you don’t have to worry about rips when using these. Each foot has 12 spikes which are 3/8 inches long. As for size, it ranges from extra-small to extra-large and there is a chart available on the website. The weight depends on the size you pick, ranging from 11oz to 13.5oz. These crampons for hiking come in a nice bag to carry them in. The pack size is just 5x3x2 inches, so it won’t take up much space in your backpack. They are probably the best microspikes you will come across, and they will work well on any surface. In addition, you’re getting a two-year warranty, so we think this is definitely worth the money. This product from Unigear gives you excellent stability on your walks, both when hiking outdoors and for everyday use during the winter. It comes with 18 spikes, although 13-spike version is also available. Sizes range from small to extra-large, so be sure to measure before buying. The harness is made from TPE which has great flexibility. Soles have strong spikes made from stainless steel – 12 in front, and 6 to support your heel. All spikes are 1/2 inch long. The plates are designed to prevent snow from balling up under your foot. These top rated microspikes also have a Velcro strap which goes over your foot creating a tighter fit. Manufacturer offers a 60-day satisfaction guarantee, which is nice. It’s very versatile, so you can use it for jogging too in addition to walking. Here we have one more affordable solution to your winter hiking troubles. These traction cleats are very lightweight so you won’t even feel them in your bag. You can choose between three colors, and also choose the layout of the plates underfoot (with different number of teeth). The elastic harness is made from strong rubber which shows solid durability, and allows you to use them on almost any shoe. The spikes are made from stainless steel, meaning they won’t be easily damaged no matter the terrain. 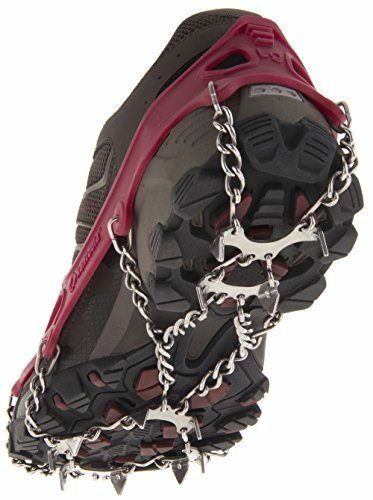 Like on most products in our crampons reviews, the chains which connect the plates with the harness are made of steel. You have several sizes to pick from, but be sure to check the size chart first. Make sure you don’t get them too small, because you may encounter problems with the rubber. As for performance, it’s excellent – you can be sure it will work well on all flat icy surfaces. These microspikes create very strong traction and secure footing. They don’t twist and bend, and sit tightly on your foot. You can choose between 13 or 19 spike versions, to match the conditions you’ll use them in. These are a great choice for active adults, but also for children and elderly to make moving around safer. Like all products we chose for you, it’s made of high quality materials – stainless steel for the spikes, steel for the connecting chains and rubber (TPE) for the harness. Weighing only 12.6oz you can truly take them anywhere. There is a choice of three sizes to find the best fit for your shoe. On top of this, if they don’t fit, you will get a refund. The price is very budget friendly, so you should really give them a try. 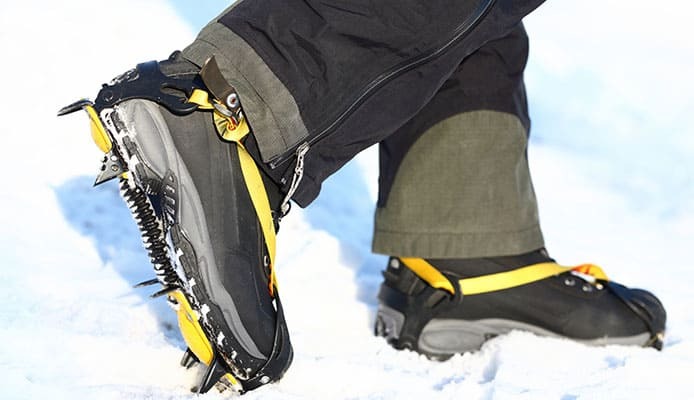 The Trail Crampons feature an ergonomic plate system to increase your stability. They are very easy to put on even in wet and cold conditions. It comes with 11 spikes strategically placed for best support. The front plate is divided in two parts connected with hinges, which improves flexibility. Spikes are made of stainless steel, while the harness is made of elastomer. All spikes are 2/3” long, giving you a good grip on any surface. The total weight is 16.3oz, so they won’t be a problem when packing a backpack. Even though this product is a bit pricier than others, the build quality gives you good value for money. This product from Ravifun is compatible with any shoe. You can put it on quickly and easily in any situation. It comes with 18 teeth (points) which are made of stainless steel. Every tooth is 0.7 inches long and strategically placed to give you the best grip. The harness is made from very elastic rubber, and it comes with an adjustable strap over it. You can choose between three sizes (there is a size chart available), and the weight is around 16 ounces per pair. Everything comes in a nice carry bag. It’s doesn’t cost a lot, but it can give you much in return when winter comes. The Trail Pro is more heavy-duty compared to most on our list, and resembles mountaineering crampons a bit. It underwent thorough testing, so you can be sure it can conquer every hill during your winter hikes. As a plus, it’s compatible with most footwear, so you can still wear your favorite boots. It has 10 carbon steel points, 4 of which are located on the heel. Depending on the position, they vary between 3/4 and 1 inch in length. There is a large anti-balling pad to prevent snow buildup underfoot. The harness is made of polycarbonate, and shaped like an X for better pressure distribution. There is also a ratchet buckle on the side to easily tighten the harness. A pair of these weighs around 24oz. As a bonus, these crampons for winter hiking come with a 2-year warranty. These traction cleats are an excellent choice for many different activities – hiking, jogging or just walking around. They give you a good grip, no matter whether you’re walking on ice, pavement covered with snow, or gravel. You can choose between two sizes, but it’s elastic so you can fit it nicely on your shoe. The harness is made of rubber, while the points are made of stainless steel, as they should be. Everything comes packed in a carry bag, so you can store it in your backpack or car trunk. Depending on the size you get the weight varies, but it’s around 0.8lbs. 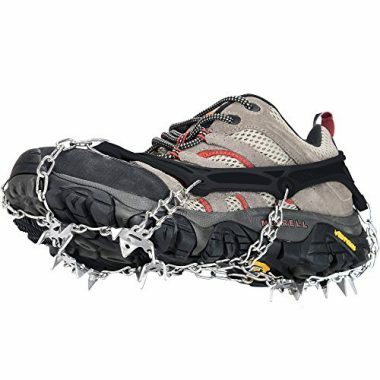 In addition, these ice crampons are very budget-friendly too. Here we have a very durable product with a harness made of silicone instead of rubber. This gives it better elasticity and a smaller chance of snapping. The spikes are made of stainless steel. There is 19 of them, and they are pointed in multiple directions to decrease the chance of slipping. This model comes with a strap over it to make the fit even better. When packed, these microspikes are very compact. They come in a nice bag for safer and more practical carrying. It’s a really good product which will find its purpose both for hiking along the trail and for going to the store during the winter. 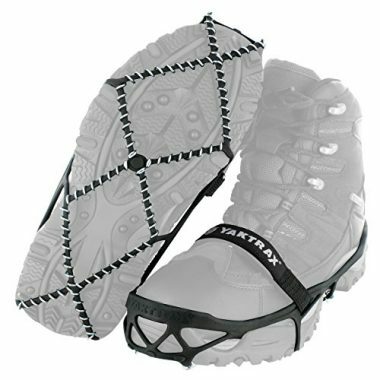 The Yaktrax is something a bit different compared to everything we featured so far. Instead of points, the design has coils for creating traction. These coils are made of 1.4mm thick steel. They are positioned in every direction, so your foot is stable no matter how you step on it. The harness is made of heavy duty rubber with additional straps. There are four sizes available, but the harness is also fairly elastic so you can easily put it on your boot. This product was tested in cold and difficult conditions, and performed very well. Many satisfied customers can attest to this, so it’s a really nice choice to keep at hand during the colder time of the year. All of these products are designed to improve your safety, but there are many differences in design. 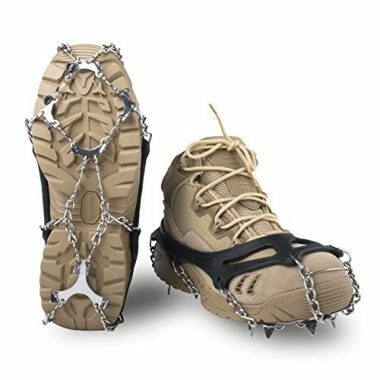 Depending on what you need and where you’re going, you might need microspikes to improve the grip but still remain comfortable to walk in, or heavy-duty crampons to climb steep surfaces. The frame on your product should be designed to make the activity easier. It can be fully flexible, semi-rigid or rigid. All microspikes come with a fully flexible frame, because it’s the best option for walking. 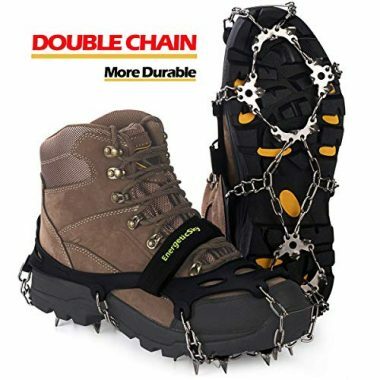 There are also many crampons with flexible frames. They usually have a hinged bar connecting the front and back plates. Aside from walking, it works well for conventional climbing too. An added plus is that the movement prevents snow from balling up under your foot. The semi-rigid frame combines the best from flexible and rigid types. It’s the most popular choice because of its versatility – you can walk while having these crampons on, but you can also make some more demanding climbs. Some crampons feature an adjustable bar so you can choose whether you want them to be flexible or semi-rigid. Finally, rigid frames offer the best precision. They sit very tightly on your boot, and give you excellent support and maneuverability when climbing. Mostly used for technical climbs, these are not the best option to walk in. This is something you need to carefully consider when shopping for new crampons. Points can vary in number, size and position. They should be placed so that your foot has traction in every direction. Microspikes usually have more points (spikes) than crampons. However, they are positioned differently and they are usually much shorter compared to crampons. On the other hand, crampons usually come with either 10 or 12 points. Versions with ten points are more commonly used for walking in the snow and regular climbing. The points should have the proper position under your sole, and they should be in line with your boot so you get the best possible support. Something that is very characteristic for crampons and can vary significantly from one product to another are the front points. These allow you better movement in different situations, depending on the design. Some ice crampons come with only one front (mono) point, while most have two. A single point offers better precision, while dual points cover a larger area. Next, they can be positioned horizontally or vertically. Horizontal points will make walking and regular climbs easier, while vertical points work like an icepick and are better for technical climbing. In addition, they can have serrated edges for better penetration into the ice. Finally, front points can be modular (replaceable) or non-modular. If you climb often and risk damaging the points, it’s smart to buy crampons with modular points. This way you can replace only them instead of the whole device. All microspikes come with harnesses which you need to stretch when you put them on your shoes. Some of the best microspikes also have straps or buckles on top which allow you to tighten everything up. On the other hand, crampons come with three different designs – step-in, strap-on and hybrid bindings. Step-in crampons require boots with a rigid sole. Boots also need to have heel and toe welts (at least 3/8” deep) for attachment. However, this binding is very secure and also very easy to attach even with gloves on. Strap-on crampons feature an elastic harness instead of heel clips and toe rails. This makes it possible to use them with your favorite climbing or hiking boots. They are not as tight or precise as step-in type, but the performance is very good nevertheless. These usually come with either a semi-rigid or a flexible frame. Hybrid crampons are a mixture of the previous two. They have an elastic webbing in the toe area, while the heel has a clip so it can click into place. For this reason you need a boot with a heel welt and preferably a rigid sole. Crampons and microspikes are exposed to harsh conditions and really need to be durable. This is especially true for points. For this reason, they are made of different types of metal. Steel is the obvious choice because it’s strong, inexpensive and very resistant to damage. However, it can corrode, which is a problem in wet conditions (including snow and ice). For this reason, most points are made of stainless steel. It’s resistant to corrosion, in addition to all of the upsides of regular steel. On the other hand, some manufacturers choose aluminum when making their crampons. This is because it’s significantly lighter compared to steel. It performs very well on snow and ice, but can be damaged much quicker if you encounter rocky surfaces on your way. In addition to metal, the frame features parts which are flexible – harnesses on microspikes and strap-on crampons. They need to be elastic and fit almost any shoe you put them on. For this reason, manufacturers commonly choose rubber, silicone or nylon. It’s important that this material doesn’t snap when stretched, and also that it doesn’t deteriorate when exposed to low temperatures. Depending on the product you get, you may be able to adjust it to your shoe. Most microspikes don’t allow this – they come in pre-made sizes and you need to be careful to pick the right one so you don’t need to overstretch it. On the other hand, the linking bar we talked about (which connects heel and toe plates) allows you to adjust length too. This way the spikes can be positioned just right to give you the best stability for walking and climbing. As for weight, it depends on the materials used. Like we mentioned, steel crampons are heavier but offer greater durability, so it’s up to you to decide what is more important in the given situation. Always make sure to buy the right crampons for the boots you own. Compare carefully, and try the combination if possible. 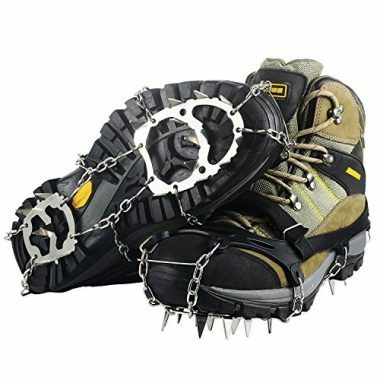 As we suggested, microspikes and strap-on crampons will work with most boots out there (as long as the size is right). You should consider this combo if you’re mostly going to use it for hiking. Furthermore, boot soles come with different flexibility too. You will have the biggest comfort and least amount of movement between boot and crampon if they have similar if not the same rigidity. If you want to use rigid step-in crampons, you need to have a stiff boot. Q: What Are Hiking Crampons? A: These are traction devices designed to give you better grip and stability when the surface you’re walking on is covered with ice and snow. They are attached to your boots and greatly reduce the chance of slipping, falling down and potential injury. This way you can relax and enjoy yourself instead of worrying about every step you’re going to make. Q: When Do I Need Hiking Crampons? A: You should have them in your backpack whenever you expect to come across snow or ice on your hike. As we pointed out, it may become slippery in your hiking boots and you may need additional help to walk safer or make your climb possible. They won’t take much space in your backpack, especially microspikes. In addition, they are compatible with hiking gaiters. 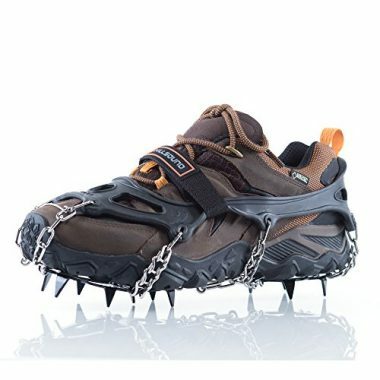 Q: What Is The Difference Between Crampons And Microspikes? A: The main difference is in the intended use, and consequently in the design. 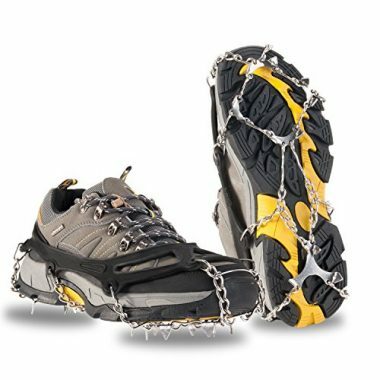 Microspikes are made for more conventional use – walking around town, not-too-demanding hikes and other ice or snow-covered surfaces which aren’t very steep. They have shorter points, great compatibility with most shoes and nice comfort when walking. On the other hand, crampons are generally more heavy duty traction gear. They have longer points and different configuration. 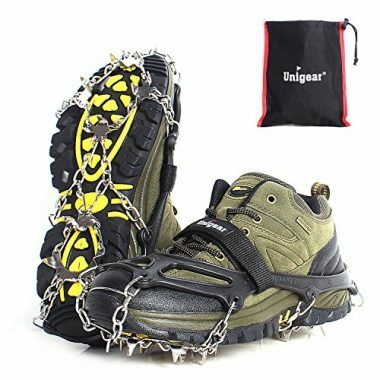 While some are very good for hikes (if you need added stability), others are designed for more difficult terrain when you require a firmer grip on the surface – steep slopes covered with ice or deep snow for example. 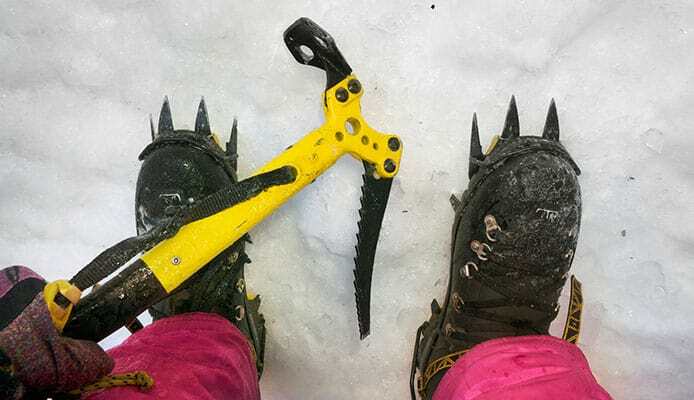 Crampons and microspikes are a great investment for your winter excursions, and should be on your checklist when preparing for hiking and winter camping. They are designed to make moving around easier and more pleasant, as well as save you from a potential injury of course. As you had the opportunity to see, there are some significant differences between products – they won’t work the same in every situation. The best crampons should make your life easier whatever you’re doing, so be sure to study the guide and figure out what you’re looking for. Have fun and stay safe! 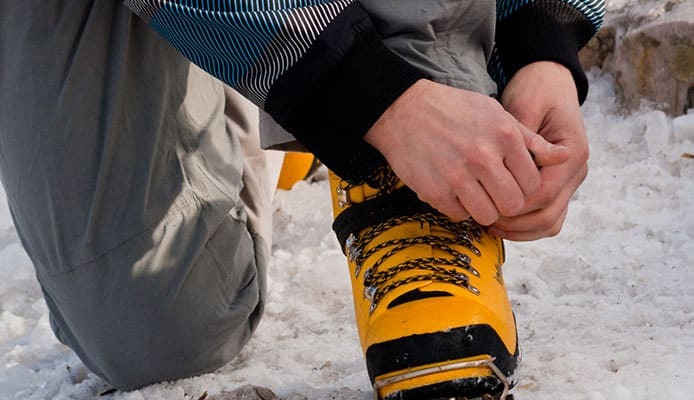 Have you tried crampons or microspikes that made it onto our list? How did they perform? Where did you use them? Are they durable? Please share your experience with us in the comment section below.